Are you kind to your gums? We’ll show you how, here at ToothKind. If not treated promptly, early stage gum disease (gingivitis) can progress to advanced gum disease, which is commonly known as periodontitis. It is for this reason that early detection and treatment of gum disease is critical. 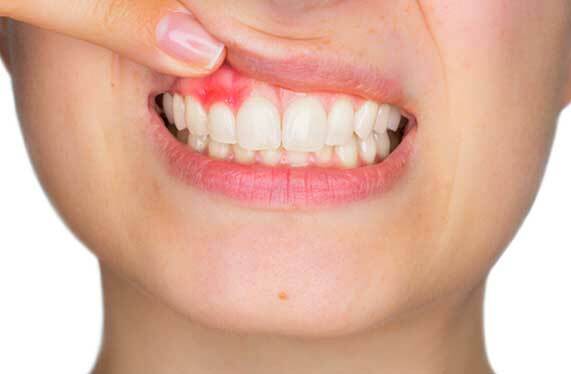 The symptoms of periodontitis include bleeding from inflamed gums (especially when brushing/flossing), and pain when eating, especially if there are loose teeth. It can also cause bad breath, an unpleasant taste and tooth sensitivity. When left untreated, periodontitis can cause irreversible damage to the supporting tissue around the teeth. In some cases, it can even lead to tooth loss. Periodontitis is also strongly linked to some major systemic diseases, such as heart disease, diabetes, and some forms of arthritis. It is especially important to keep your gums and teeth clean and healthy if you already suffer from any of these conditions. Commonly referred to as gum and jaw bone disease, periodontitis or periodontal disease is a bacterial disease of the supporting structures of the teeth such as the gum, periodontal ligament and the alveolar bone (part of the jawbone). Periodontitis is caused by a build-up of plaque on the teeth. This build-up can lead to gingivitis and is common among children and adults. Periodontal disease can cause considerable damage to these structures which provide support and nourishment to your teeth. When the structure of the gums becomes compromised, the seal between the teeth and gums opens up, and the bacterial infection deepens into the tissue. This can cause severe damage to the underlying bone and periodontal ligament and if left untreated will result in tooth loss. Periodontitis is a leading cause of tooth loss in adults. Professional teeth cleaning by your ToothKind dentist is the only way to remove this build up once the gums become compromised, and the bacteria move into the root ligament and bone. Do your gums often bleed when you brush or floss your teeth? Are your gums sore, swollen or red? Do you get mouth sores? Do you have spaces developing between your teeth? Do you often have a bad taste in your mouth? Periodontitis is treatable. Early diagnosis makes an enormous difference as the more advanced the disease, the harder it will be to prevent or treat. Treatment aims to minimise the bacteria building up down the root of the tooth into the bone, allowing your body to begin to heal. By maintaining good oral health at home, having a professional deep cleaning of your teeth and regular teeth maintenance by your ToothKind dentist, treatment can be successful. To make an appointment at one of our Brisbane clinics, contact Toothkind today.